As of Jan. 22, over 3,600 employees have joined Healthy Emory Connect. This new platform is accessible via desktop and a free mobile app. Benefits-eligible Emory employees have started to take advantage of a new tool in their toolkit to make getting and staying healthier a little easier — Healthy Emory Connect. This new platform is accessible via desktop and through a mobile app that is downloadable for free from the Apple App Store and Google Play for Android devices. 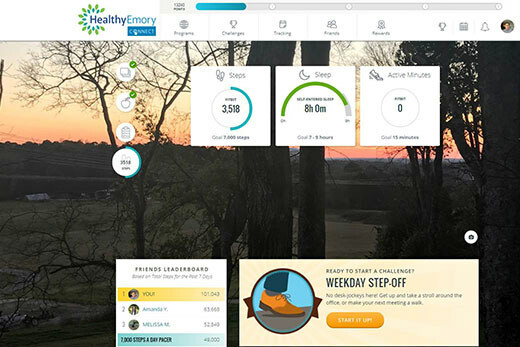 Healthy Emory Connect allows employees to complete their 2018 online health risk assessment; earn many of their 2018 Emory medical plan incentives; stay updated on upcoming fitness classes, programs and events; and invite friends and family members to join them in health challenges like the upcoming Move More Challenge in March. So far over 3,600 employees have joined Healthy Emory Connect. Emory University (13 percent) leads Emory Healthcare (12 percent) in the percentage of employees who have joined. At Emory University, the Office of General Counsel is in the lead with 39 percent while Emory Investment and Human Resources are tied for second place at 38 percent. At Emory Healthcare, Emory Healthcare Inc. is tied for the lead with St. Joseph’s Medical group with 19 percent, while the Emory Clinic is in second place at 14 percent. Learn more about Healthy Emory Connect.